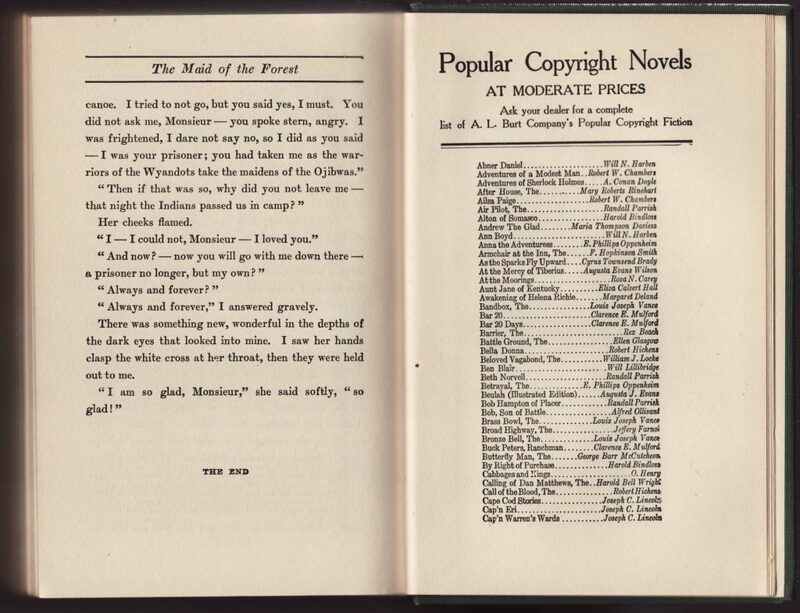 Burt published numerous reprint series including many gift and juvenile series from 1883 until the company was sold in 1937. A few, such as the Cornell Series, Burt’s Home Library and Burt’s Pocket Edition of Standard Classics included titles by standard, “classic,” authors. Burt also published newer fiction, still under copyright, sometimes previously published but often licensed from other publishers and issued not long after the initial publication of the titles (if not simultaneously). These titles were published as Burt’s Popular Copyright Fiction, sometimes referred to as Burt’s Popular Copyright Novels or Burt’s Popular Edition. Such sort-of series were really just collections of popular fiction issued in large numbers. 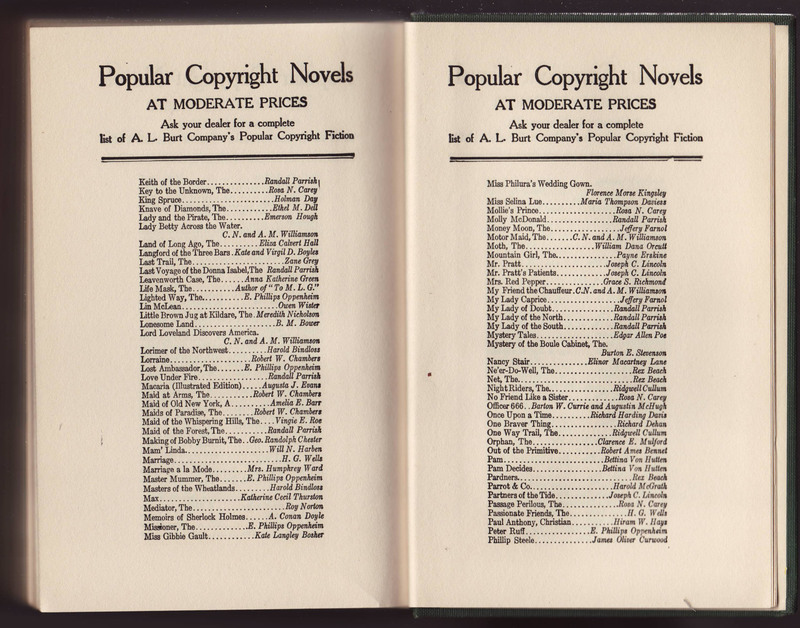 The series includes 328 titles at the time of the publication of the title below; undoubtedly many more were issued before Burt was sold in the late 1930s. 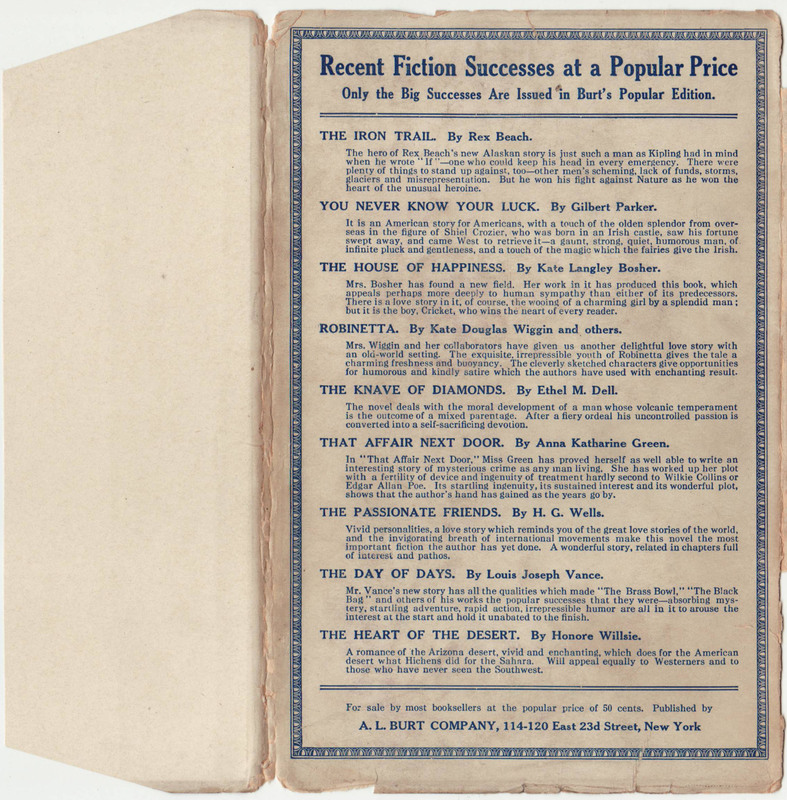 The books are not priced (on the jacket) but were listed in contemporary advertisements as .50 cents in the early 1920s. 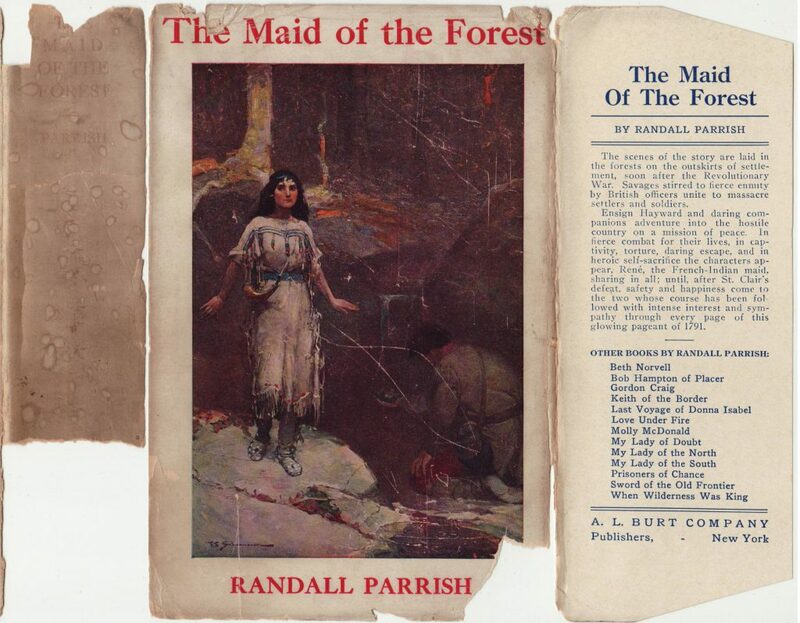 Randall Parrish was a popular novelist in the early 20th century. 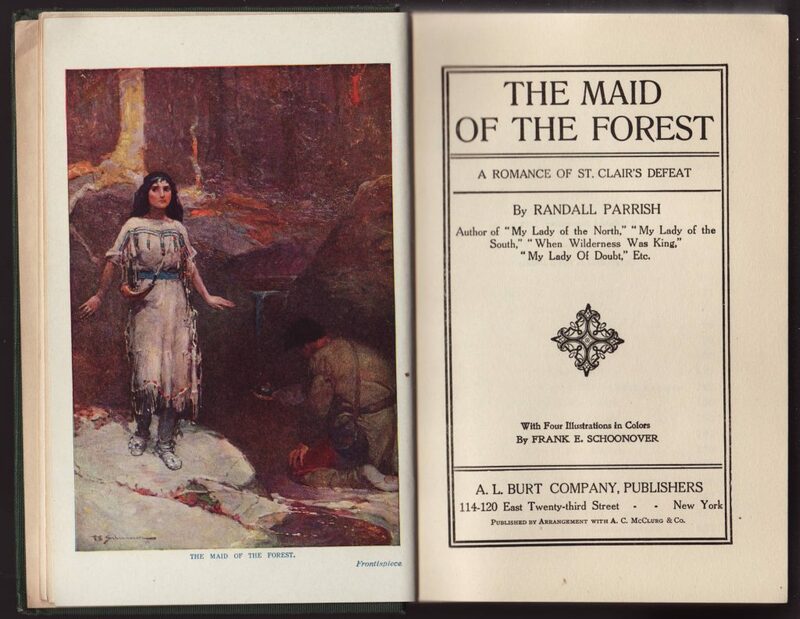 The Maid of the Forest was originally issued in 1913 by his publisher A.C. McClurg & Co., (Chicago) as well as McClelland & Goodchild (Toronto) in Canada. 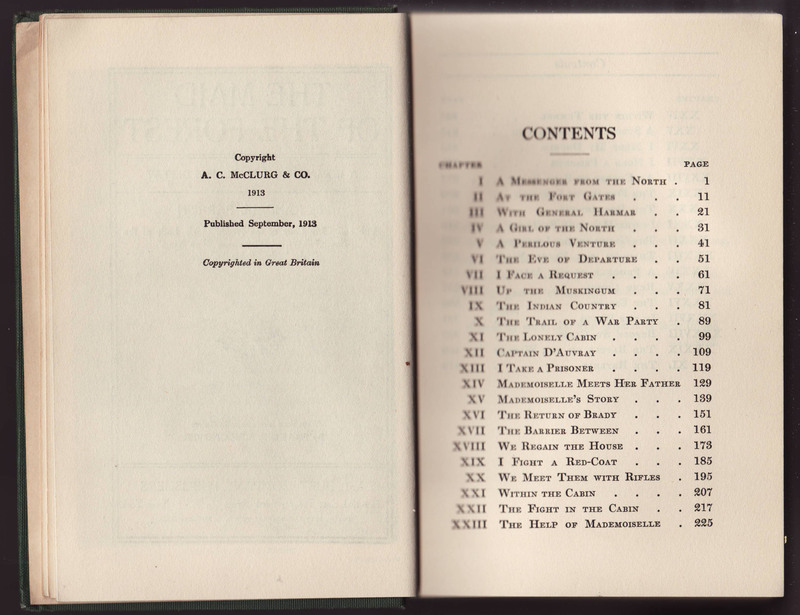 Burt also issued the book in 1913, probably covering the East Coast U.S. market (McClurg seems to have focused its distribution in the Midwest U.S.). 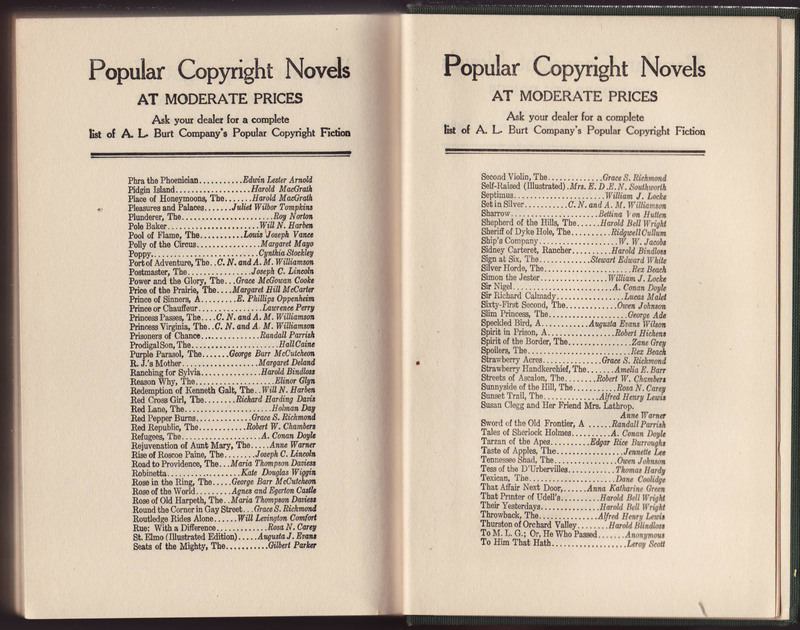 The series jackets are unique to each title, with color jacket art also appearing as a frontispiece and, in some cases, one of several illustrations in an illustrated edition. Additional Randall Parrish titles are advertised on the front jacket flap. 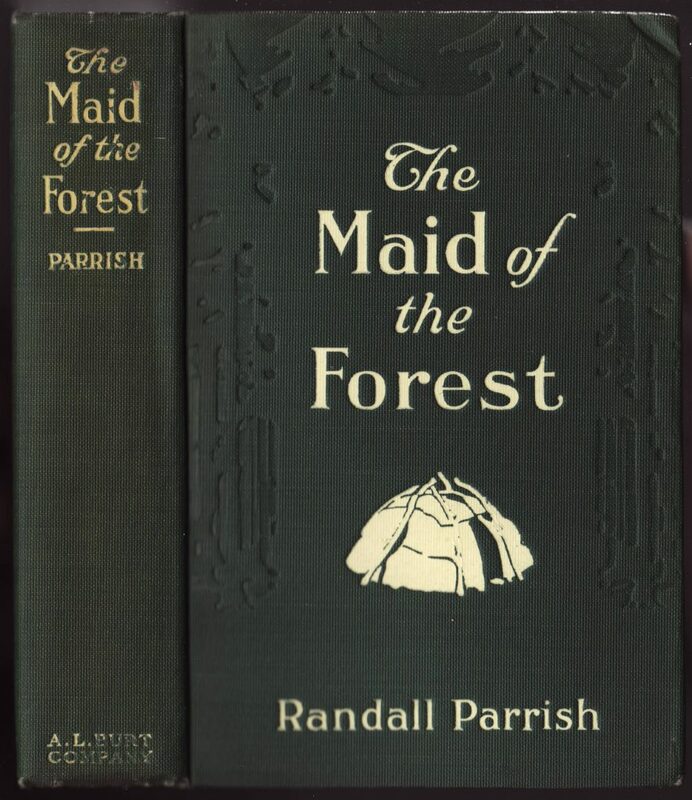 The bindings are in cloth, with debossed decorations unique to the title (in this case, pine tree silhouettes). 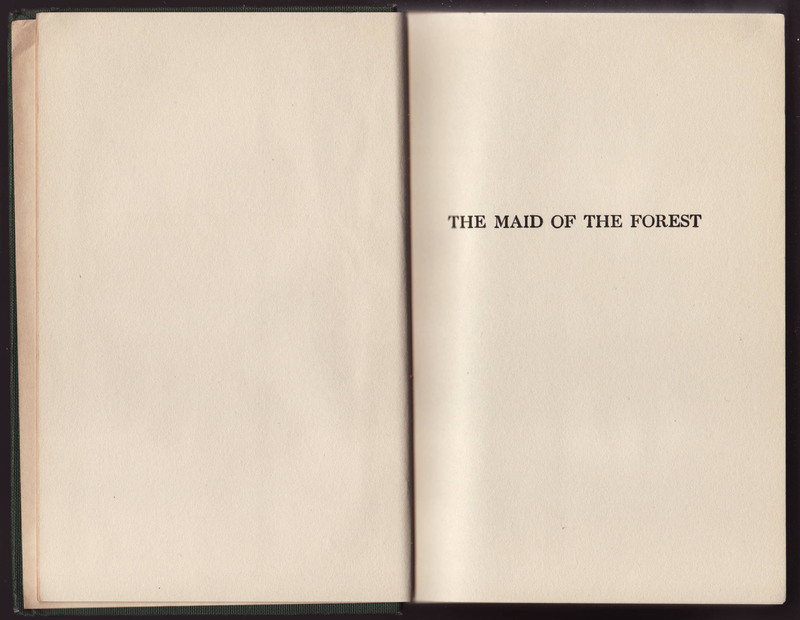 The author, title, and publisher are printed in tan, along with a forest-dwelling, undoubtedly part of the novel. 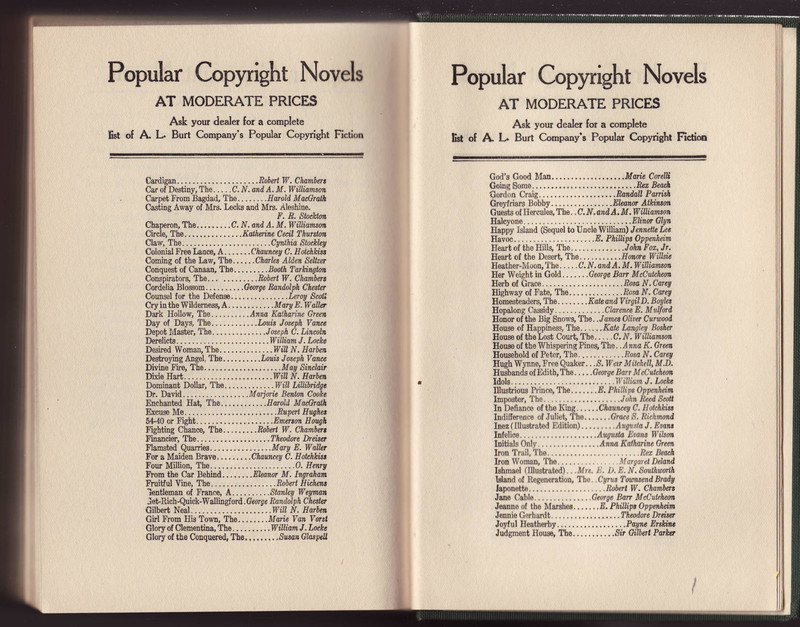 The copyright (1913) and publication date (September 1913) are included on the copyright page. 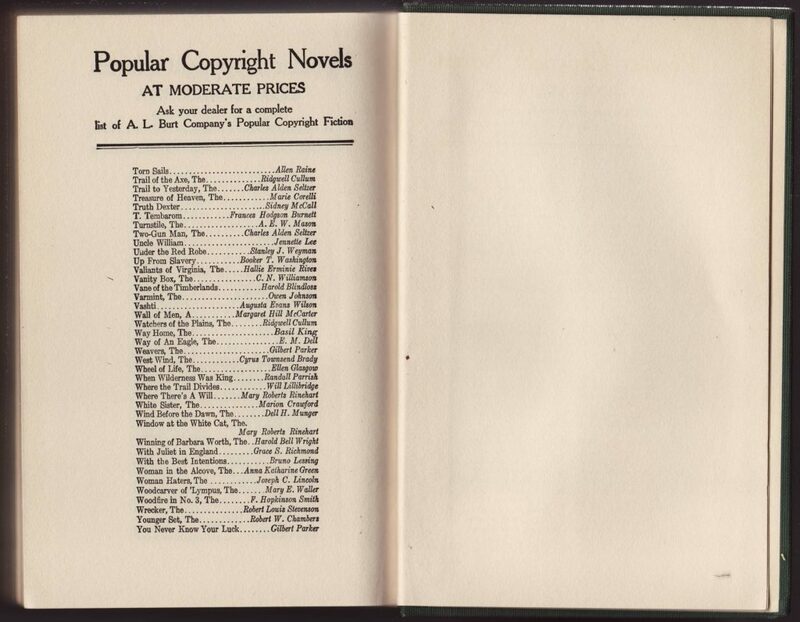 The end of the book is graced by a list of 328 titles in the series, alphabetized by title.